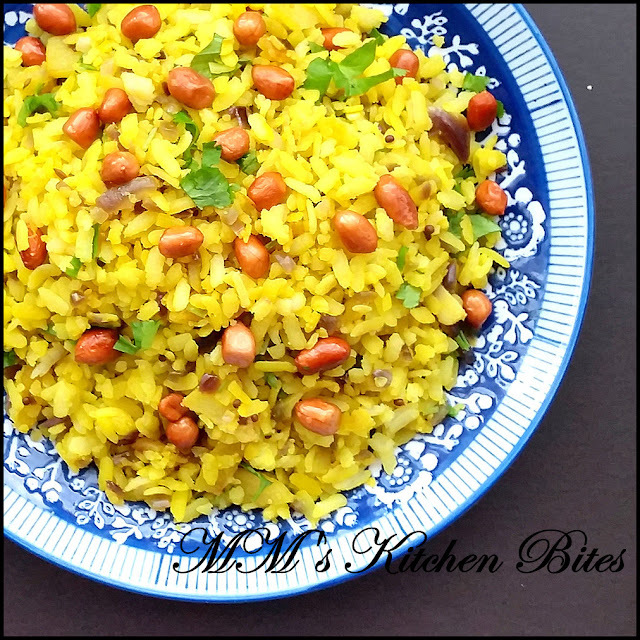 MM's Kitchen Bites: Kanda Batata Poha...bring out the Sun!! 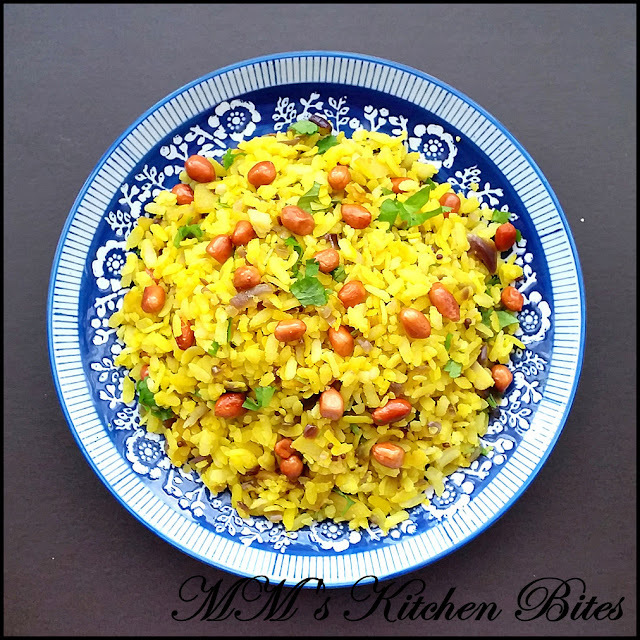 Kanda Batata Poha...bring out the Sun!! Toss the poha in a colander to get rid of poha dust. Rinse the poha under cold running water for a few seconds and then keep it aside for 10-15 minutes so that the water drains out completely (finish your prep in the meantime). Add in the peanuts and fry on low heat till the peanuts are golden and crunchy. Constantly keep on stirring and don’t let the peanuts burn. Drain well with slotted spoon and keep aside. Add in the potatoes and shallow fry the cubed potato till light golden and crisp. Drain and keep aside. Heat the remaining oil in the same pan and add cumin/mustard seeds. When the seeds splutter, add the hing and green chilies, then stir in the onions and cook until translucent, 5 to 6 minutes. Add the salt, turmeric and sugar and mix well. Cook for 15–20 seconds until the raw smell of turmeric goes away. Add the fried potatoes and drained out poha, and stir to mix well. Cover and reduce the heat to low, and cook for a couple of minutes. Sprinkle a tablespoon or two of milk or water all over, stir to mix well and cover again. Let it cook covered for another 2–3 minutes. Stir lightly to mix and fluff. Taste and adjust seasonings. Add in the lemon juice, peanuts and coriander. Mix well and serve hot. Add some chopped curry leaves along with mustard seeds. Add 1 tsp of ginger paste along with salt and turmeric. Veg it up – after the onions are done, you can add a cup of other chopped veggies of your choice and cool until al-dente. Dry roast the peanuts instead of frying. Use cubed boiled potato instead of frying. Skip the peanuts and make it nut free. Skip the milk and use water to make it vegan. Garnish with some freshly grated coconut or bhujiya namkeen. Korean Salads...life beyond Pajeon is as easy!! Black Pepper Chicken..."It is, What It Is"